Welcome! My list of books is always growing! As a thank you for visiting my website, I want to give you an exclusive free book, Vortex Street, right after the introduction. To see all available books on Amazon, visit my Author Page on Amazon here. Or, click the link for a specific book below. Vortex Street: a virtual chapbook. This is a compilation of poems written while traveling and coming home, serious and spiritual; along with a handful of flash fiction stories, quirky and hilarious. Vortex Street is available exclusively for people joining my mailing list. It is my only book NOT on Amazon. Release date: April 5, 2019. Available for preorder. First book in the Satchel Pong Chronicles. Satchel Pong is a magistrate in Turan City–specifically the Meteorologist. Over time, he’s noticed that temperatures are rising, and he must convince his people to migrate. Aided and directed by the Dirigibles, he sets out on a voyage to lead his people to safety. Dystopian Steampunk adventure, first in a trilogy. On April 21, 2017 I releas ed my seventh book, How to Make a Positive Cultural Impact. What’s it about? A friend of mine complained that he had too many leadership books to read on his shelves, and wished someone would sum it all up. Challenge accepted. This e-book-only offering is a quick read, at only about 8,300 words, and sells for only $2.99 USD. If you’re leading a team, then you’re building a culture. What you do every day impacts the operating values in that culture. How can you bring empathy and creativity to work? The keys are simple to understand but may be challenging to implement! Enjoy. Who is Stetson Jeff? Part Walker, Texas Ranger; part Forrest Gump; part 1980s kickbox movie trope spoof. these adventures will have you laughing until you cry. These paperbacks arrived December 30, 2016. Volume 1 in The Stetson Jeff Adventure Series includes Stetson Jeff books 1, 2, and 3, PLUS an exclusive short story titled “A Very Stetson Christmas”. You can buy the paperback volume, or do the e-books one at a time, and watch for Stetson Jeff #4 coming soon! This series will eventually have nine books! Note: Beatdown in Bangkok is FREE on Amazon! Stetson Jeff has traveled to Morocco, where he meets a movie star, feeds majoun (a dessert with hashish) to a camel, and tears off across the desert. Because he’s Stetson Jeff, that’s why. Stetson Jeff comes home to the States after his travels in Thailand and Morocco, but stops off in Amish Country. Highlight: the low-speed chase– horse and buggy vs. forklift. 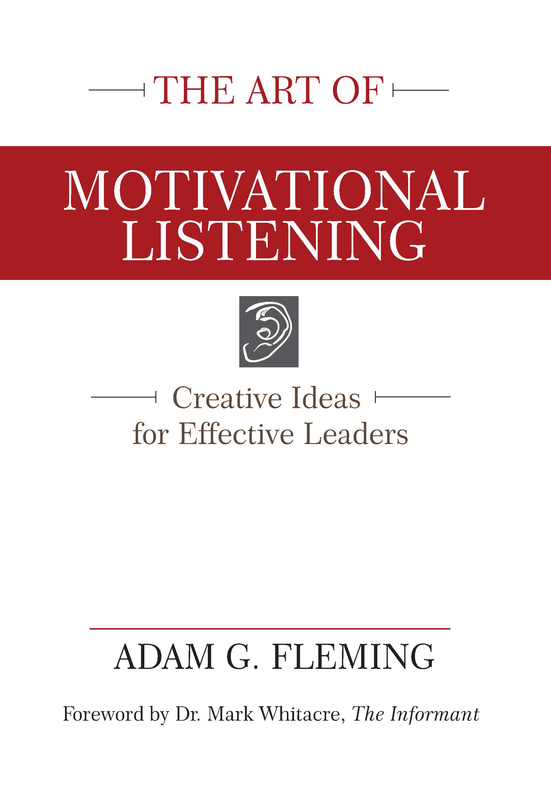 2015: The Art of Motivational Listening: Creative Ideas for Effective Leaders. This book contains a series of essays on leadership coaching from the first six or seven years of my coaching career. Great for coaches or anyone who wants to become a better listener. I decided not to write a “How-to” book and instead opted to use stories to help you shift perspectives. You can buy this book at Amazon. White Buffalo Gold was published in 2012. In a dying Nebraska town, high school students face difficult choices: move on to the big city? Or stay home? When Emily begins to work for the town’s largest employer, a nursing home, she discovers a mystery. Was Harmony the site of a major gold rush? Can she draw the memories out of the town’s oldest citizens? Reviews, ratings, synopsis and Kindle version are all on Amazon. If you are interested in bulk copies of paperback books, please contact me (agf@adamgfleming.com) for special pricing on volume purchases.